Capital of Bengal, and seat of government of British India. The Jews of Calcutta now number about 2,150, of whom 150 are European and the remainder natives of Asiatic Turkey, Persia, and southern Arabia. Just when the first Jew settled in Calcutta is uncertain; but Jewish traders did business there many years ago. Shalome David Cohen is the first permanent settler of whom there is authentic record toward the end of the eighteenth century. He became a favorite of the raja of Lucknow, and even had the honor of riding with him on his elephant. Cohen built the first synagogue in Calcutta, known as the Old Synagogue. The second synagogue, Naveh Shalome, situated in Canning street, was built nearly a century ago by Ezekiel Judah Jacob, another Jewish pioneer. It had until lately the income (229 rupees monthly) from a large compound, which was formerly distributed among the poor. 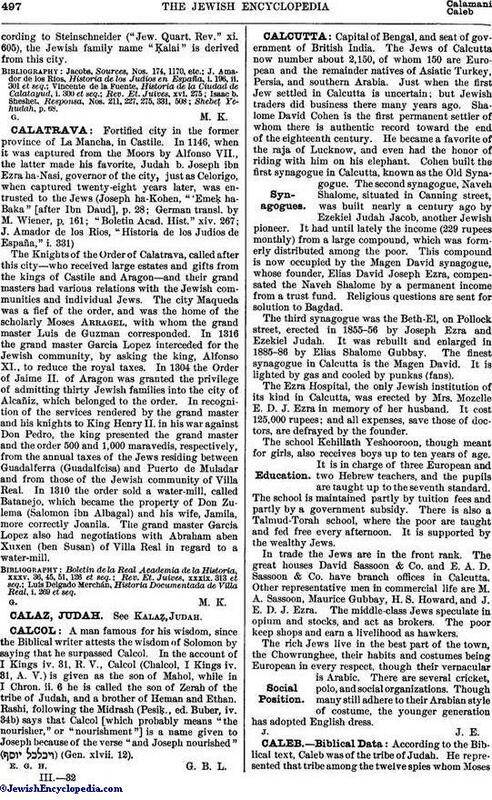 This compound is now occupied by the Magen David synagogue, whose founder, Elias David Joseph Ezra, compensated the Naveh Shalome by a permanent income from a trust fund. Religious questions are sent for solution to Bagdad. The third synagogue was the Beth-El, on Pollock street, erected in 1855-56 by Joseph Ezra and Ezekiel Judah. It was rebuilt and enlarged in 1885-86 by Elias Shalome Gubbay. The finest synagogue in Calcutta is the Magen David. It is lighted by gas and cooled by punkas (fans). The Ezra Hospital, the only Jewish institution of its kind in Calcutta, was erected by Mrs. Mozelle E. D. J. Ezra in memory of her husband. It cost 125,000 rupees; and all expenses, save those of doctors, are defrayed by the founder. The school Kehillath Yeshooroon, though meant for girls, also receives boys up to ten years of age. It is in charge of three European and two Hebrew teachers, and the pupils are taught up to the seventh standard. The school is maintained partly by tuition fees and partly by a government subsidy. There is also a Talmud-Torah school, where the poor are taught and fed free every afternoon. It is supported by the wealthy Jews. In trade the Jews are in the front rank. The great houses David Sassoon & Co. and E. A. D. Sassoon & Co. have branch offices in Calcutta. Other representative men in commercial life are M. A. Sassoon, Maurice Gubbay, H. S. Howard, and J. E. D. J. Ezra. The middle-class Jews speculate in opium and stocks, and act as brokers. The poor keep shops and earn a livelihood as hawkers. The rich Jews live in the best part of the town, the Chowrunghee, their habits and costumes being European in every respect, though their vernacular is Arabic. There are several cricket, polo, and social organizations. Though many still adhere to their Arabian style of costume, the younger generation has adopted English dress.